Lorrie knits and sews: I did it!! The vest was finished Saturday night and the socks Sunday night! Mother of pearl buttons are from my button stash. I couldn't find any green buttons that I liked. 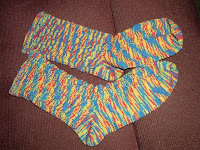 Socks were finally finished during closing ceremonies. The pattern is written. I'm going to try to put some patterns up on Ravelry. 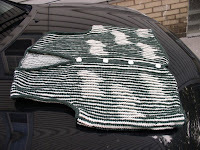 The Ravelry Vest award is on my sidebar. I may not get one for the socks, since Ravelry was working on Beijing time and I was working on US eastern time. I'm busy at work, so less knitting time there.Wednesday I judge needlework at the Geauga County Fair, the oldest county fair in Ohio.